In general parlance, Interest refers to the additional amount paid for obtaining monetary assistance from the lender. In finance term, when we borrow some amount from any bank or financial institution, we have to repay that amount along with some additional amount for availing that facility. Such extra amount paid is termed as Interest. Interest can be of different types like Simple Interest, Compound Interest, Effective Interest, Annual Yield etc. In this article, we will discuss Simple Interest. Simple Interest Formula is one of the easiest ways of calculating interest on Short term Loans and Advances and Term Loans. In the case of Simple Interest, Interest is calculated on the Loan amount, which is also termed as Principal Amount of loan. In this case, Interest is not calculated on Interest Amount accruing on the loan amount, likewise in case of Compound Interest Formula. To calculate Simple Interest, we need Amount Borrowed along with the period for which it has been borrowed and the Rate of Interest. Let us understand this formula with the help of some examples. Ram took a loan from his banker of Rs.100000 for a period of 5 years. The rate of interest was 5% per annum. Calculate the interest amount and his total obligation at the end of year 5. 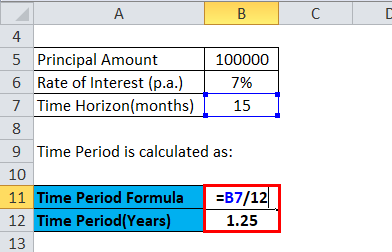 Calculate the EMI and Interest amount per period. 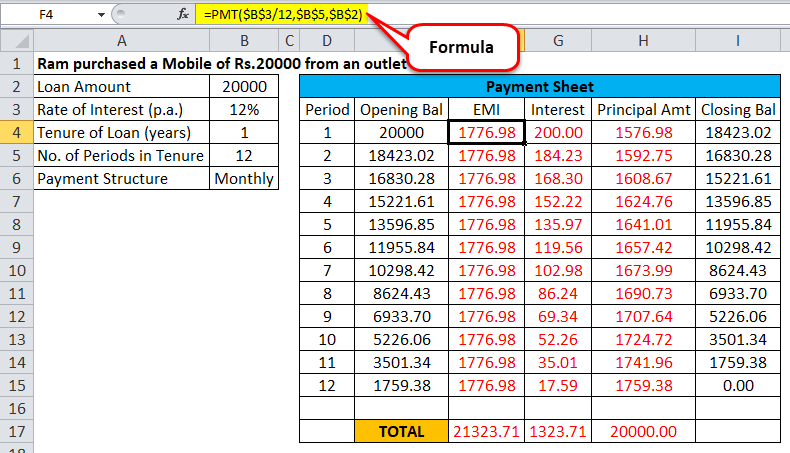 By using the formula, we come to know that Ram has to pay an EMI of Rs.1776.98 for 12 months. His Interest payment for each period will reduce and correspondingly principal repayment will increase gradually, resulting in full payment of loan amount, along with interest at the end of 12 months. As we can see that EMI will remain the same and with each repayment of monthly installment, Outstanding Loan Amount will also reduce and will become zero at the end of loan term. DHFL Ltd issued a coupon-bearing bond of Rs.100000 which carries an interest rate of 7% p.a. the bond has a useful life of 15 months, after which the bond will be redeemed. So, the interest earned by an investor on the redeemable bond is Rs.8750. Interest Rate Formula is helpful in knowing the Interest obligation of the borrower for the loan undertaken and it also helps the lender like financial institutions and banks to calculate the net interest income earned for the assistance given. 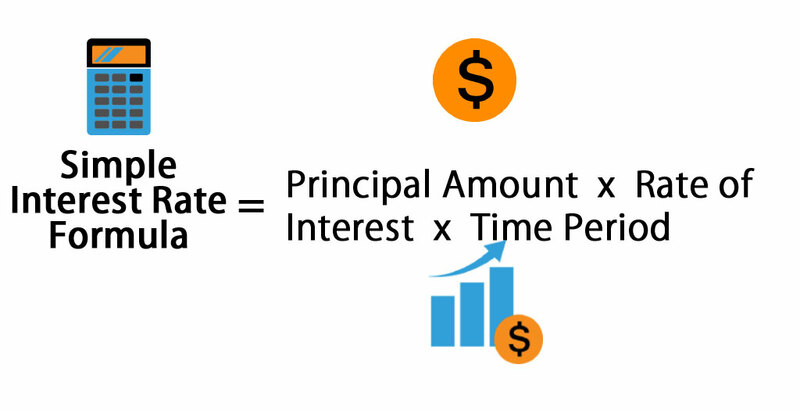 While calculating simple interest, one thing to remember is that Rate of Interest and Time Period of loan should be in symmetry i.e. If the rate of interest is per annum then a number of periods must also be expressed in yearly terms. Conversely, if the Time period is monthly/quarterly, the Interest rate should also be converted according to monthly/quarterly frequency. In this formula, the Interest amount is higher in the Initial period of Loan and it gradually decreases over the remaining life of the loan. 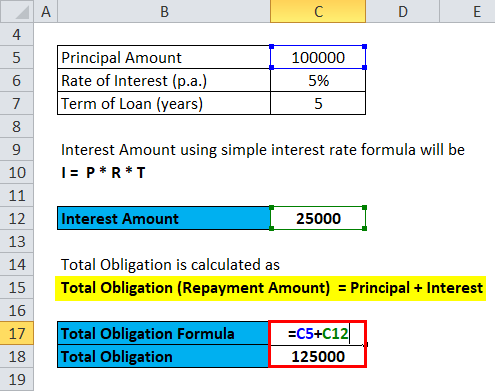 This formula is one of the simplest formula for calculating Interest Obligation and it does not take into account the features of compound interest formula i.e. Interest on interest. 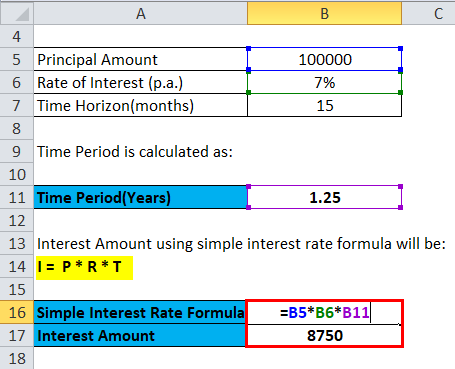 This formula is used in case of Short Term Loans & Advances and Borrowings. 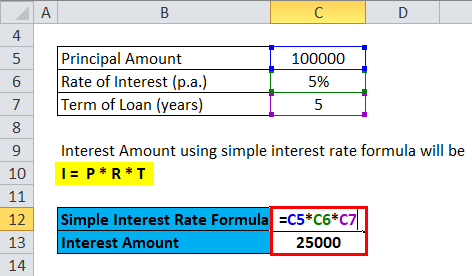 This formula is also used by Banking Industries for calculating interest on Saving Bank accounts and Short Term Deposits. Interest on Car Loans and Other Consumer Loans is also calculated through Simple Interest Rate Formula. Certificate of Deposits (CD) is also embedded with Simple Interest Rate feature. Bonds also pay simple interest in the form of coupon payment. How to Calculate Debt Ratio?